In order to build a great and profitable relationship with potential clients, customers, and even investors, you need to be able to properly introduce your business to them. 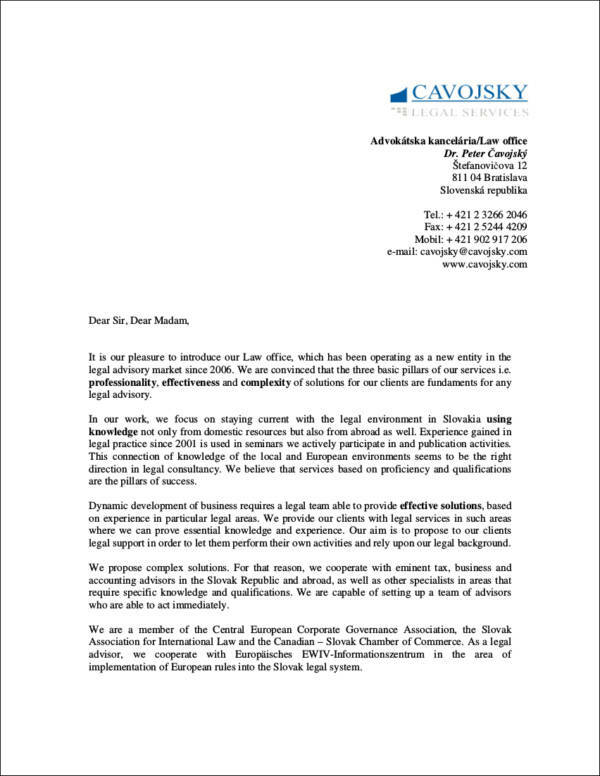 One way of doing this is by coming up with a well-written company introduction letter. 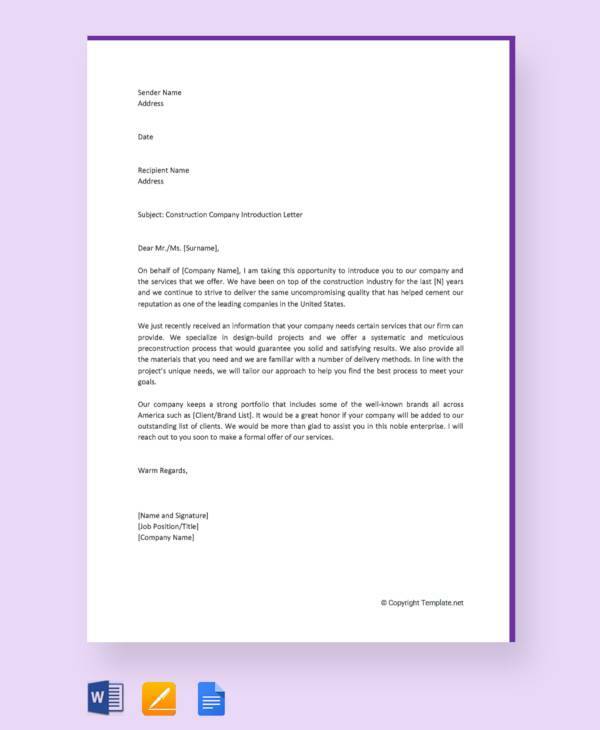 Your company introduction letter aims to give the reader a reason to want to know more about what your company is all about, what it has to offer, and how they can get in touch with you should they be interested to invest or avail of the products/services that you have. 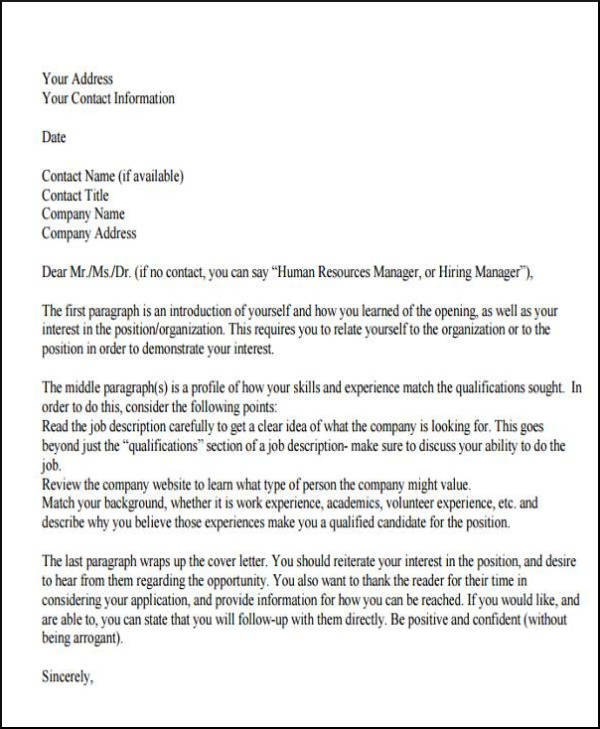 Writing an introduction letter can be quite a challenge especially if you are writing one for the first time. However, you do not need to worry as we are here to help you out. 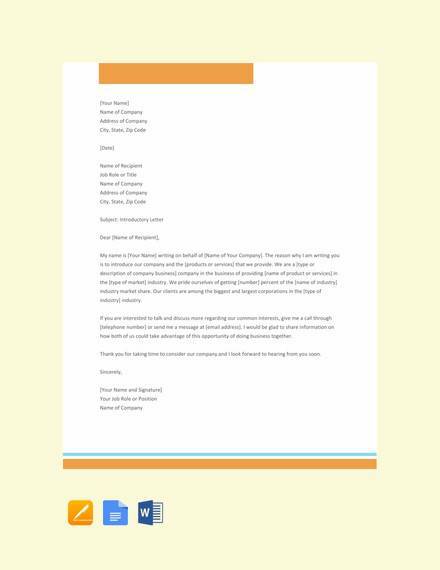 We will be sharing a guideline with you regarding how to write an introduction letter. We even have a few sample introduction letters to download for free that you can definitely use as reference once you start making your very own introduction letter. Check everything out below! 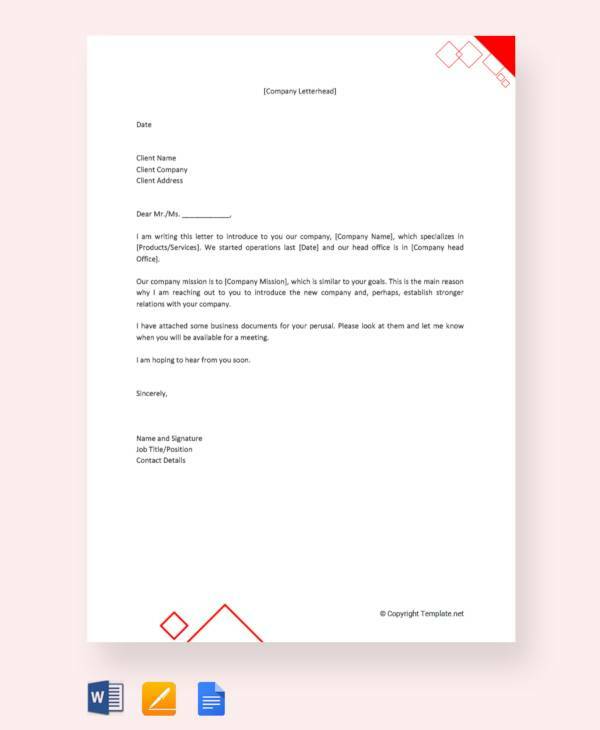 When it comes to a business introduction letter you want to make sure that you end up with one that has all the necessary information that the reader needs to know about your business. It needs to have the right words that will entice potential clients, customers, and investors to check out what it is that you have to offer. Carefully chosen words and a comprehensive arrangement of statements is sure to impress the reader and would most definitely pique his/her interest in what your company has to offer. It should also be easy to understand and should definitely avoid making use of words that are too flowery and words that are too complicated understand. This will help in retaining the attention of your reader. Focusing on what the reader needs is also a good tip to keep in mind when it comes to writing these letters. If you want to make a lasting first impression to your reader, make sure to follow the guideline that we will be sharing with you. One good way of ensuring that the reader will be interested in your company and what it offers. 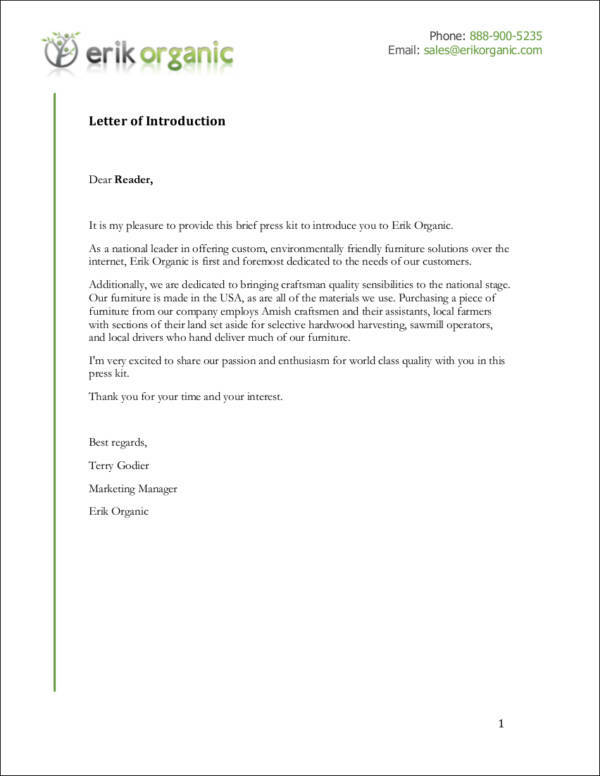 This is one of the most effective ways of writing a good introduction letter. Letting the reader know what it is that you can do to fill in their need will most definitely help in getting them to read your whole letter. It is important that you take advantage of this opportunity. Think about what makes you different from the other businesses in the same industry and use this as a basis on how you will determine why the reader should take an interest in you. Simply establishing what your reader needs and addressing this can definitely make your letter a strong one. 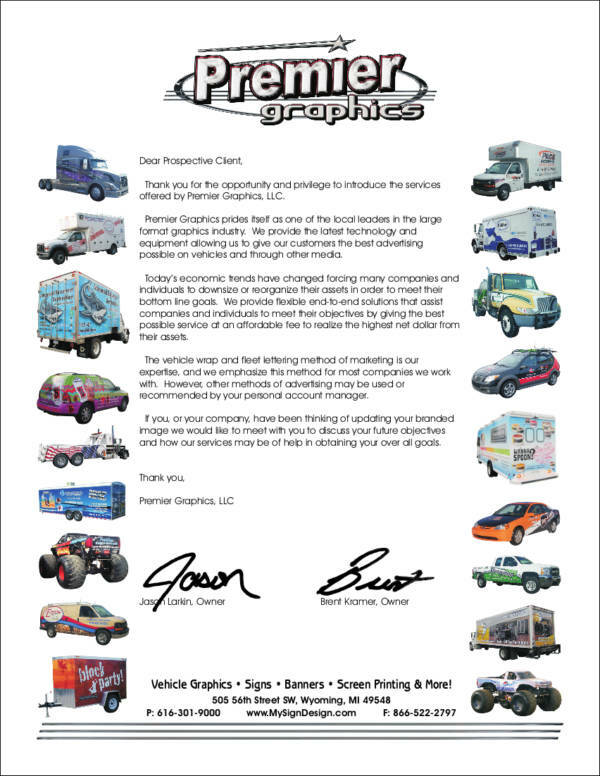 In order to make your business introduction letters stand out, you should make sure that you start it with a statement that is also strong and is also going to make it a very memorable one. Make sure that the first few sentences of your introduction letter is where you will be talking about the customer’s needs. Starting with an intriguing question is going to be a good one. 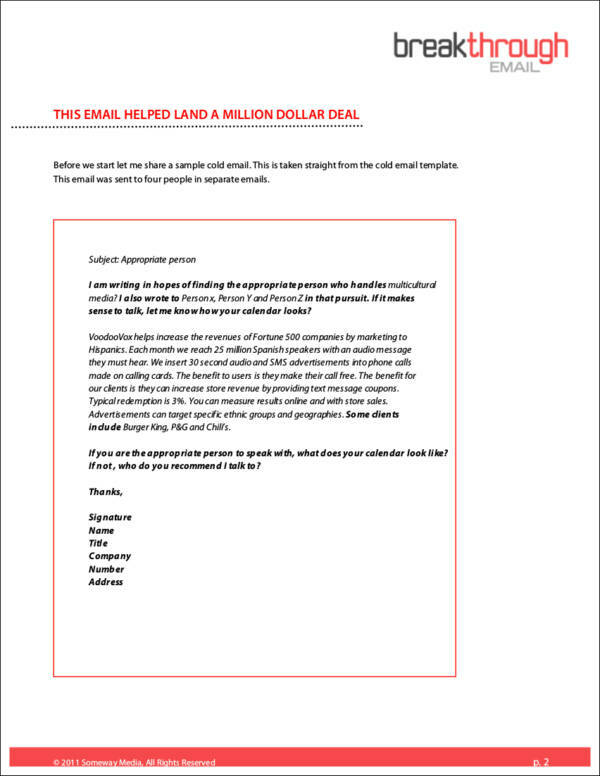 Starting with a good lead would definitely help you end up with an introduction letter that is going to convince the reader that you are the solution that they are looking for. 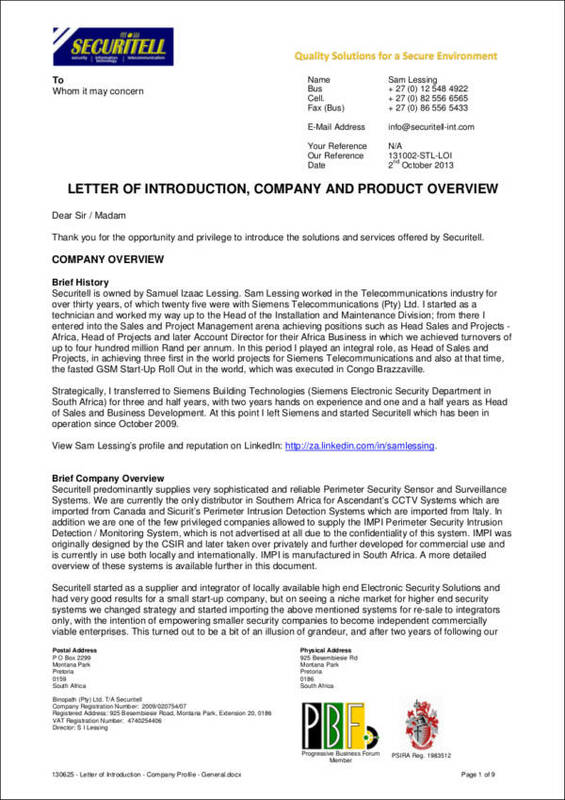 Your introduction letter is not a sales letter, so do not try to make a sale by using this introduction letter. What you want to do is to just basically introduce your company and what it is all about. You want to let them know that you are a credible company and that you have what it takes to address their need. That’s basically all you need to write in your letter. Big blocks of texts are a definite no for introduction letters. With introduction letters, you should not just write down everything into a big block of paragraph. Breaking it up into smaller paragraphs, incorporating bullets and lists will help to make your letter a whole lot easier on the reader’s eyes. Graphs, illustrations, and infographics are also going to be great. Let your reader know what they should do next. Never leave it up to your reader to figure out what they should do. One good example would be to tell them that they should visit your website or your social media accounts. Tell them to also give you a call if they have any questions or if there is anything that they saw was unclear in the letter. You may also take the initiative to let them know that you will be calling a few days after you send the letter. Give them a time frame about when you will be calling. 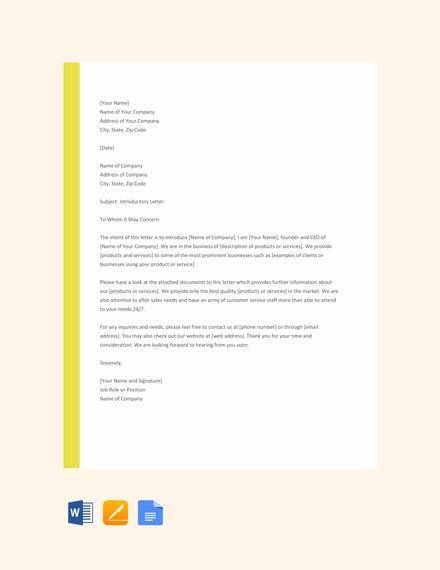 To encourage your readers to get in touch with you, you need to ensure that you format your company introduction letter properly. It will also definitely help in ensuring that your letters also actually get read. 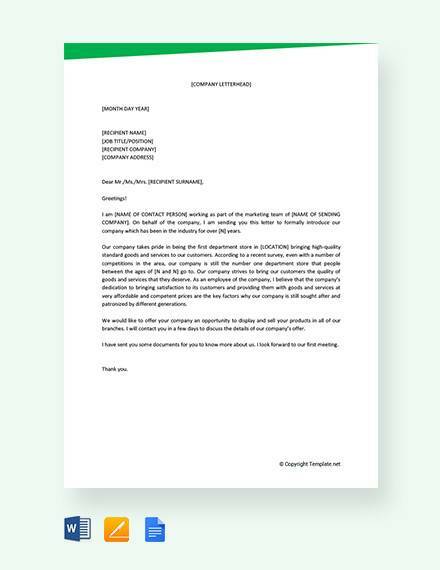 If you have no idea how a company introduction letter format looks like, you better keep reading as we have a few tips that we would like to share with you right at this very moment. Check it out. Make use of good quality printing paper. A 20lb paper that is unruled is most certainly appropriate for these letters. They could either be a short paper (8″ × 11.5″) or an A4 (8.27″ × 11.69″) bond paper. Plain white paper is advised but it all depends on what you find is appropriate and would be a good representation of your company. Ensure that you make use of a font size that is not less that 10pt but also not more than 12pt. A professional font style is also advised for these letters. A font style that is in the Sans Serif or Serif family such as Times New Roman, Arial, and Georgia are appropriate for introduction letters. Your letter can either be semi-blocked (some elements right aligned and some are left aligned), full blocked (everything is aligned to the left), or modified block. All the margins of your page should be between 0.5″ to 1″. This helps to make good use of the white space that makes reading easy on the eyes. Keep the tone of your letter friendly and a little bit informal so as not to seem intimidating. Make your statements conversational as if you are talking to the reader in person. 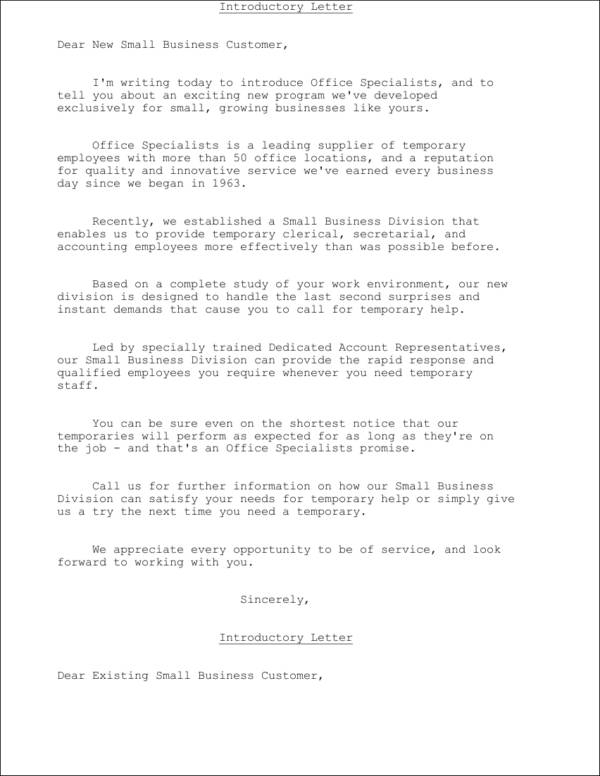 Check out the proper business letter format for more information on how to format letters that are used for businesses. The date would be found about two spaces after your contact details. Keep the spacing of your letter single. Leave a space in between each paragraph. 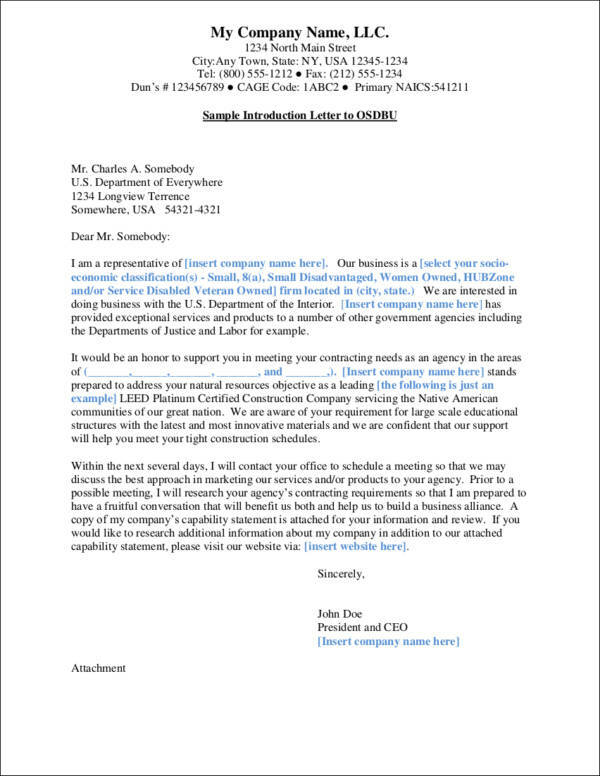 “Dear [Recipient’s Last Name]” if you are writing a specific recipient. “Dear Madam/Sir” if you are writing a generic introduction. The body of your letter should not be too long. Keep it brief. 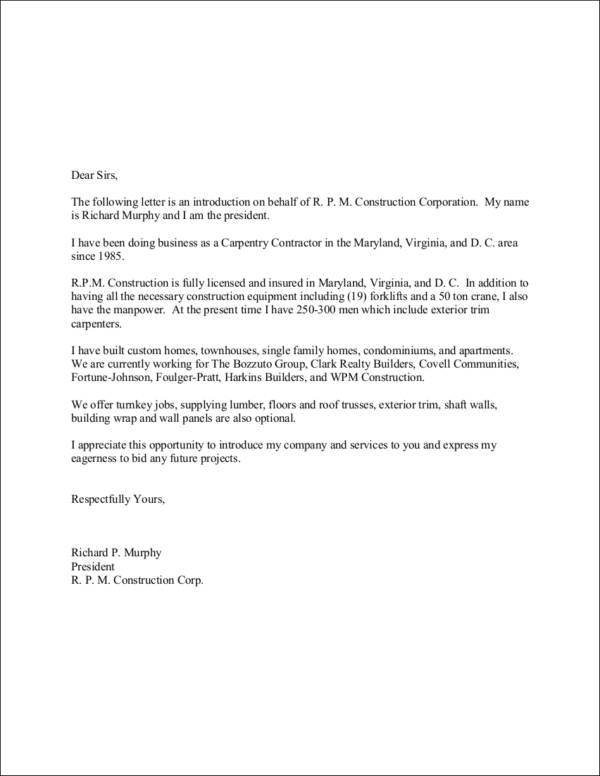 First paragraph – Introduce yourself, and what your designation in the company is. Let the reader know what the purpose of the letter is. 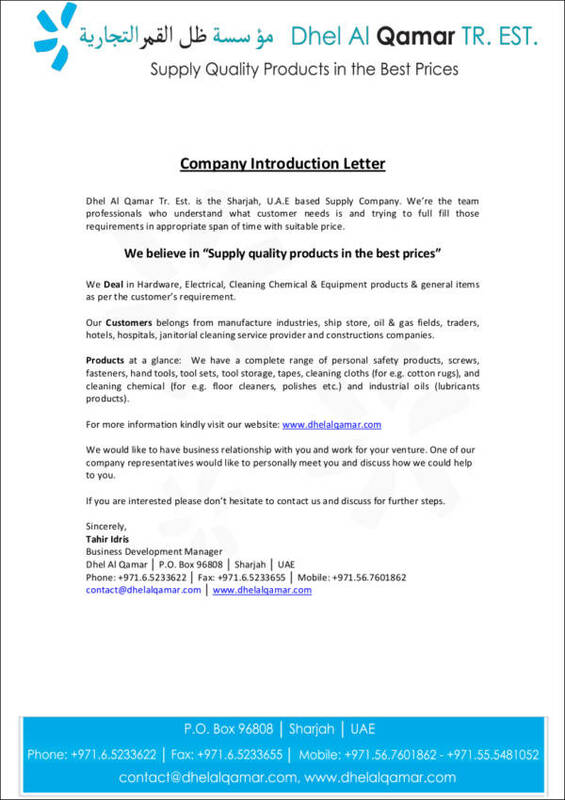 Middle paragraph – Details about the company as well as the the products and services offered are reflected here. 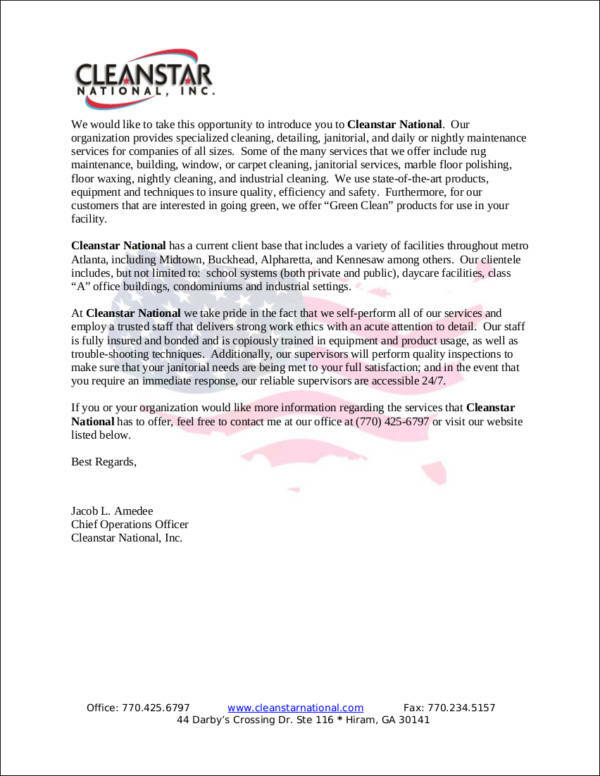 Concluding paragraph – Reiterate the purpose of the letter and give them the next few steps the reader needs to do in to get in touch with the company. Make sure you close your letter properly.